Neem tree or Azadirachta indica is a native tree to India. 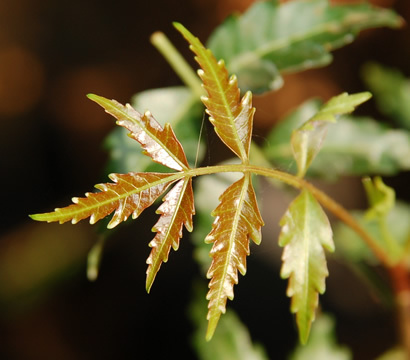 Popular for its medicinal uses, neem leaves, seeds and bark for various ailments. Being a natural healer, it is quite a preferred treatment amongst people who are afraid of the antibiotic side effects. For medicinal purpose, Neem extracts of its seed, leaf and bark are effectively used to treat a number of skin, hair and other health probl ems. Since the natural neem constitutes of antifungal, antiviral, anti-inflammatory and anti-carcinogenic properties, its pure extract can work wonders as a medicine. Here's the step by step procedure for making neem leaf extract, which is an effective pest repellent. First of all mash a considerable amount of neem leaves deftly within mortar and pestle. Now place this mashed neem leaves paste in a pot or container. Next, add some water in the mashed neem leaves paste and cover the container or pot with the help of a lid. Now, let this mixture steep for around 72 hours i.e. around three days.